Master Chu consulted on the creation of the Martial Arts Studies B.A. Program at the University of Bridgeport in Connecticut. This program is the only one of its kind in the U.S. and his student Dan Zegibe teaches his system as part of the curriculum. Master Chu’s tai chi, Nei Kung, Eternal Spring and meditation books are the official textbooks for the course. For more information on the Martial Arts Studies B.A. Program, contact University of Bridgeport International College. Chu Tai Chi student John Signoriello was honored as fighter of the year in front of kickboxers and martial arts masters from all over the world at the Saturday night closing banquet of the U.S. Chinese Kuoshu Federation’s 2007 US International Kuoshu competition outside Baltimore, Maryland. The “Lei Tai Competitor of the Year” tribute capped 22-year-old Hunter College student Signoriello’s two-year reign as holder of the middleweight ‘b’ division championship belt, with wins at the Kuoshu full-contact competitions in 2005 and 2006. Signoriello flew for the honor from Taipei, Taiwan, where he is studying Chinese language on a merit scholarship. Banquet attendees included Signoriello’s Sifu C.K. Chu, as well as his Signoriello’s parents and fellow Chu Tai Chi students. At the July 2006 tournament Signoriello successfully defended his championship title by beating three fighters on a single day (Saturday 7/22/06), including defeat of the 2004 champ in one of three tough elimination rounds. Signoriello’s triumphs have repeatedly demonstrated the versatility of his tai chi training against more specialized hard styles. These Lei Tai kickboxing rules included an open platform and open-finger gloves for grappling. Signoriello’s signature tai chi moves include a front heel-kick that sent competitors off the three-foot-high lei tai platform, as well as rollback yielding and grabbing. The tai chi influence could be seen at the 2007 fights, where fighters trained in hard styles incorporated tai chi kicks, parry-punches, and two-palm attacks. Hunt Valley, Maryland–Students of C.K. Chu’s Chu Tai Chi school battled fighters from the U.S. and the world to take multiple honors at the U.S. Chinese Kuoshu Federation’s 2005 US International Kuoshu Championship. John Signoriello won three fights in a single day (Saturday 7/22/06) to defend his middle-weight ‘b’ championship belt. Signoriello took top honors for the second straight year, defeating the 2004 champ in one of three tough elimination rounds. Signoriello’s triumphs again demonstrated the versatility of his tai chi training against more specialized hard styles. These Lei Tai kickboxing rules included an open platform and open-finger gloves for grappling. Chu Tai Chi students also took four push hands medals. Rene Gonzalez won first place in limited step heavyweight push-hands competition, and second place in moving step. Kate Wasilewski won second place in both limited step and moving step. Hunt Valley, Maryland — Students of C.K. Chu’s Chu Tai Chi school battled fighters from the U.S. and the world to take multiple honors at the U.S. Chinese Kuoshu Federation’s 2005 US International Kuoshu Championship. See highlights of title matches. 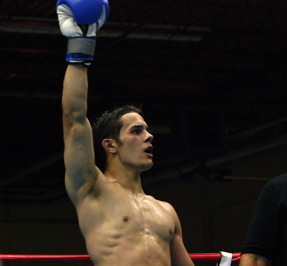 John Signoriello won three three-round fights, two by TKO and one by unanimous decision, in one day to earn the middle-weight ‘b’ championship belt. The success came just four weeks after Signoriello victory at the Sport Fighting Titans Kickboxing Championships event on June 18, 2005, in New York City, which culminated in a majority draw favoring Signoriello. Signoriello’s triumphs also demonstrated the versatility of his tai chi training against more specialized hard styles because they came under different rule systems, first San Da (boxing gloves and kickboxing rules, with boxing ring) and then Lei Tai (open platform with open-finger gloves for grappling). 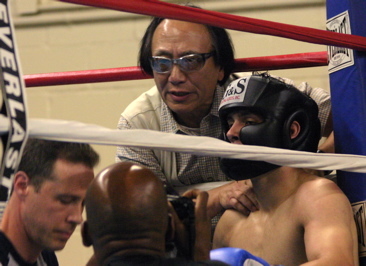 In his fighting debut, Hyland Harris won his first three-round fight by TKO, beating an opponent 20 years his junior. Unable to continue because of a muscle pull, Harris forfeited his next fight and took a Bronze medal in the tournament’s middle-weight ‘c’ division. In their push-hands competition debuts, Rene Gonzalez won second place in moving step, and Jesse Shadoan won third in limited step, both in the heavy weight category. Their successes also were a testament to their training, which enabled them to compete the same day they learned the tournament rules.